For kids age 8 & older - Learn to dive in the pool! 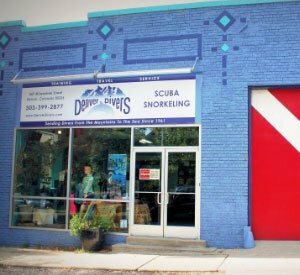 Instructors that work with kids at Denver Divers are not only SSI-certified Dive Control Specialists (assistant instructors) and full instructors. Each has also received advanced training to teach children specifically. Most are parents themselves! Denver Divers owns a whole fleet of child-sized gear. The gear we use for Scuba Rangers and birthday parties include Oceanic XXS AND XXXS BCDs. You can rent or buy them for your child. We also carry children's wetsuits - both shorties and full wetsuits in 3mm, 5mm, and 7mm thickness. Of course we have children's masks, fins and snorkels, although kids are big enough to use adult gear earlier than you might think!